Whenever God brings about change it is for our benefit and His glory. Each and every one us must be prepared for the next move of God. We cannot know the will of God by depending on familiar knowledge. God’s will is always outside of that which we are familiar with. When God tells us to move, it is always outside of our comfort zone. If we are going to do the works of Christ it requires a changed heart. We can’t change our behavior without changing our heart. When our hearts are changed, everything changes, and we can begin to do the works of Christ. 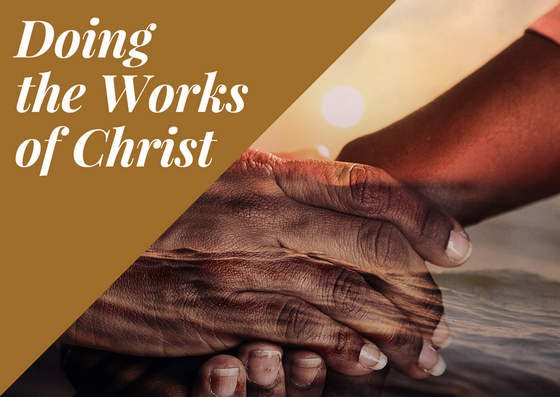 Subtitle: Doing the Works of Christ requires a changed heart. When the Lord is alive in your heart. When your hearts are changed and you believe in your heart, you know He is alive. Because He is alive, you know that His promises are true. b) You can have confidence in Him. Because He is alive, you know His word is true. God is alive in your hearts, you can trust Him. You will seek His righteousness. Before you look for answers anywhere else, you seek His righteousness. He will not fail you. He has your best interest at heart. Believing in your hearts leads to righteousness. Before you form an opinion, you seek His righteousness. We do out of who we are. If we are the body of Christ, then we do the works of Christ. The Lord is letting us know that we can do greater works than Jesus did in His early ministry. The Lord has given us power to bring about change. Change has to take place on the inside. When our hearts are changed, everything changes and we will begin to do the works of Christ.